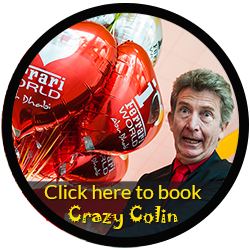 Colin Underwood, better known as Crazy Colin is acknowledged as one of Johannesburg’s leading family entertainers. His high energy, strong entertaining crazy character and incredible sharp wit leaves your audience with an engaging and memorable experience. He is a highly versatile performer with many skills and extensive international appearances in theme parks, circuses and shopping malls across the globe. In South Africa he has appeared at all major casino’s, corporate family days, schools and television appearances. When you book Colin, you are guaranteed a highly entertaining family show. Yes, this show will not only entertain the little ones but the parents and grandparents alike. He is naturally sensitive to different cultural customs. 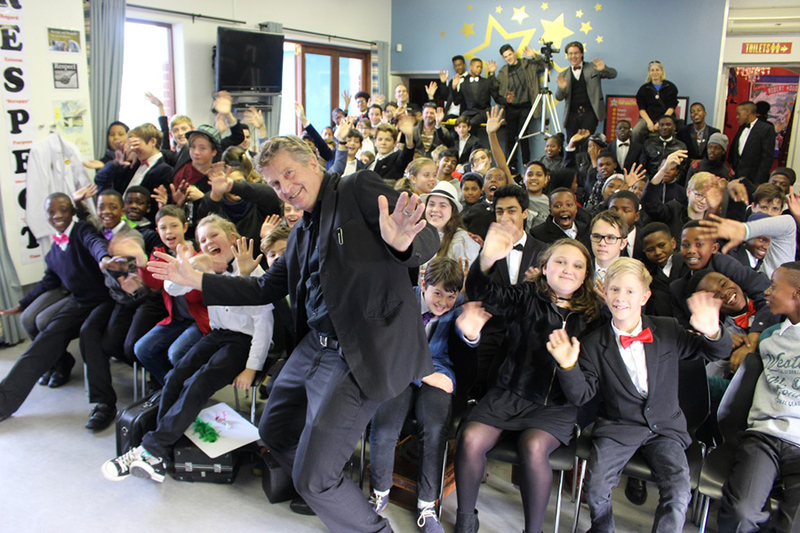 You are booking an award-winning magician, South Africa’s top juggler and 37 years of professional performing experience around the world. Colin offers two family show packages which are customised to the birthday boy or girl. Your child will be the exciting magical assistant with loads of comedy interaction, visually strong magic and laugh minute comedy for all ages. You are receiving a professional entertainer presenting his highly popular Crazy Colin Family Show with your child the Very -Important -Magicians- Assistant (VIP-MA). Colin’s performing character is so strong and endearing your mother in law will want to marry him! The magic is visual and engaging not just for the children but adults alike. The routines involve money appearing from the child’s armpits and nose and the giant appearance of a super large Chinese coin, the longest rope trick in the world, a golf bag and an egg routine with surprise milkshake production, as well as numerous comedy props and the unexpected magical appearance of Rocky the crazy raccoon from a large Mad hatter hat. Colin closes his show with a highly engaging comedy juggling routine and a multiple balloon present for the birthday child. There is music and engaging humour throughout the show. Duration approximately 45 to 50 minutes of crazy fun! Colin is a leader in his field. All the children will receive a giveaway balloon animal, sword, dog or ray gun depending on their preferences. This complete magical birthday experience with your child as the main feature will entertain young and old creating a truly memorable birthday party experience. THE PLATINUM EXPERIENCE IS AROUND 90MINUTES OF FUN! I DO NOT REQUIRE BALLOONS? This is the same highly entertaining comedy and magical experience as per the Platinum package above but without the balloons. Your child will be the main feature and receive a large multiple balloon present at the end. There are many comedy moments that will entertain young and old. Colin loves to be involved in the candle blowing experience and after that will wish everyone a fond good bye leaving an endearing magical memory for all. Colin has appeared on LOCAL AND International Television, circuses, Middle East Malls and theme parks with extensive appearances at Johannesburg’s casinos and corporate family functions.